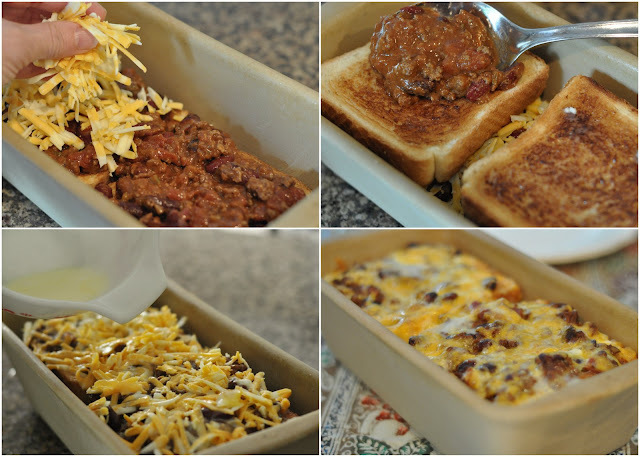 This is a great way to use up leftover chili or sloppy joe sauce. I have used a square pan, doing only one layer or used a loaf pan, doing two layers. I prefer the single layer. Add a salad and it's a quick and easy dinner. Toast bread and butter lightly, then line square greased pan with all four slices or greased loaf pan with two slices. Top with meat and cheese. Repeat layer if using loaf pan. Beat egg and milk and pour over top. that looks amazing and how easy! Ooo, that looks like a perfect busy-day supper!!! Funny that just this week I was craving sloppy joes. Hadn't had them since busy sport filled evenings many moons ago. My low carb choice was to spread the mix over spaghetti squash (previously baked and scooped out-keeps in fridge for several days), sprinkle on some cheese and bake till hot and bubbly. Truly delicious! I'm not seeing what temperature for the oven. Did I miss it? Thanks for the heads up. I added it. What do you mean, serves 4-5? It serves 1, me! Agradable receta muy buena,abrazos hugs,hugs,. I just happen to have leftover Chili, too. Thanks for posting this recipe! Perfect timing. I made this recipe tonight and we all loved it. My kids groaned with the pleasure of it and we have leftovers for tomorrow! I used a 9x13 pan and simply lined the bottom with toast; then added the meat and cheese. I doubled the egg/milk mixture and put half on top at this point and then layered everything all over again. It was fabulous! So tasty! I used 6 pieces of toast in a 9x13, used an extra 1/4 c. milk, and put it in the oven, then remembered that the bottom heating element was broken. So I cooked it on broil with some foil over top. The bread was very soggy BUT it was still delicious. Can't wait to try it when my oven is back on line. Thanks!